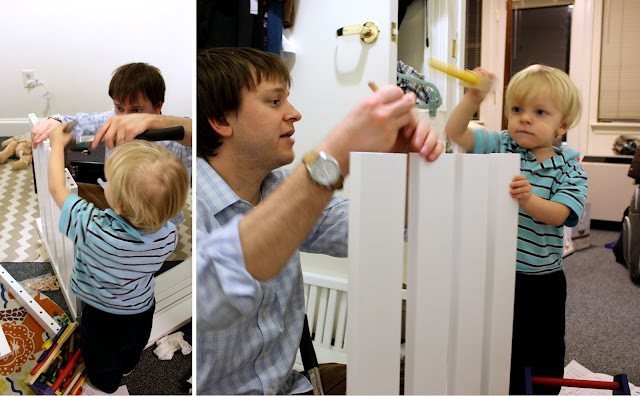 Yesterday you got a peek at our nursery + big boy room progress. The main attraction is Behr's big boy bed. We made this bed exciting from the very beginning. As soon as the box arrived in the mail, we pointed it out to Behr and told him we would wait to open it until Dad returned from a work trip. When the mattress arrived, we let the fun begin. Behr helped each step of the way from deciding where in our house the boxes should wait, to opening the boxes, to cleaning up the packing materials and finally assembling the bed with Dad. Behr even got out his trusty tool box (a gift from his best friend Bella) to hammer along side Dad. It was quite the process, but the excitement remained high and I think contributed greatly to the success of the bed so far. These two have been enjoying the best story time together since the bed was put together. I couldn't be more excited for these precious little moments each evening. Little Days is a weekly post series geared towards capturing our children and their stories. I hope that this series becomes a way to continue to encourage one another to enjoy the small moments. and spread the word #littledays. Disclaimer: Compensated links may be used in this post. I remember reading books with my baby brother Kenny in his toddler bed for hours. It really makes story time so much fun.